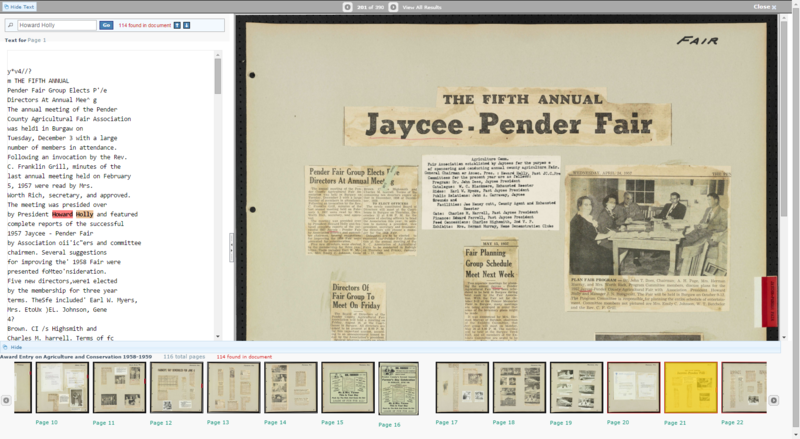 Even for those of us who work at the Digital Heritage Center, browsing scrapbooks or other printed items on DigitalNC can be frustrating. 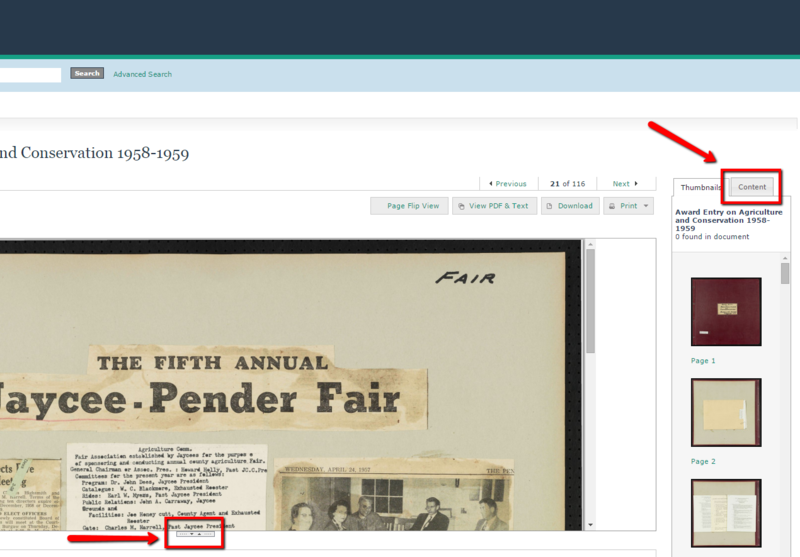 The viewer for a single item, which displays yearbooks, photographs, and short booklets pretty well, can be cumbersome for longer and larger items. Here are a few features that may not be immediately apparent but that we hope might help. This is a screenshot of the viewer, showing the page of a scrapbook. At default, maybe about one third of the scrapbook page is showing (your screen may vary from mine). To the right, only a few thumbnails are visible at any one time. To move back and forth between pages, you’ll need to scroll through and click on each thumbnail one by one. If you want to see the full text for items, you have to toggle back and forth between tabs. So, what are your options? If you drag down the little toggle arrows at the bottom of the viewer, you’ll have more control over how much of the page is visible on your screen. You can also switch from “Thumbnails” to “Content” in the right-hand ribbon. This means more page links are visible at once, so you have to scroll less when moving from page to page. To move back and forth, just click on the page you’d like to turn. A favorite way to view scrapbooks and similar items is to click the View PDF & Text button, located right next to the Page Flip View button. View PDF & Text brings up an alternative view that takes advantage of a lot more screen real estate. See below. With this view, you’re able to see more of each page. A lot more thumbnails are stretched out across the bottom of the screen, so you’ll scroll less. Full text (if it’s present) comes up on the left hand side with each page. If you’ve searched for text, as above, and there are hits on the page, you’ll see the highlight right away instead of having to switch back and forth between tabs. You can hide the full text by using the button in the upper left, if you’d like even more of the main image to show. We hope these tips are helpful. If you have any questions about the interface or what we’ve mentioned, let us know. The Alamance County Public Libraries has just shared issues of the State Dispatch, later known as the Twice-a-Week Dispatch, on DigitalNC. Issues are available from 1908-1915 (with some exceptions). The tagline of the Dispatch began as “A Republican newspaper devoted to the upbuilding of American homes and American industries,” and later changed to include the word “progressive.” The paper covers Republican events and ideas, as well as local news from Burlington and surrounding areas of Alamance county like Graham and Whitsett. Later issues see the beginnings of World War I. This paper joins other Alamance county papers on DigitalNC: The Alamance Gleaner, the Mebane Leader, and the Elon University Student Newspaper. Alamance County Public Libraries has also shared additional items that can be found through their contributor page. We’ve helped Durham Technical Community College add several additional campus publications to their collection of digitized materials on DigitalNC. Recent issues of The Final Draft, 2013-2015. The Final Draft is a journal that shares creative works produced by Durham Tech students and faculty. These journals include poetry, short stories, and visual art. Two additional volumes (1968, 1969) of The Widget. Durham Tech’s yearbook, these two join one earlier volume already on the site. View all of the items Durham Technical Community College has shared via DigitalNC. A new batch of materials has been uploaded to DigitalNC from The Grand Lodge of Ancient, Free and Accepted Masons of North Carolina. 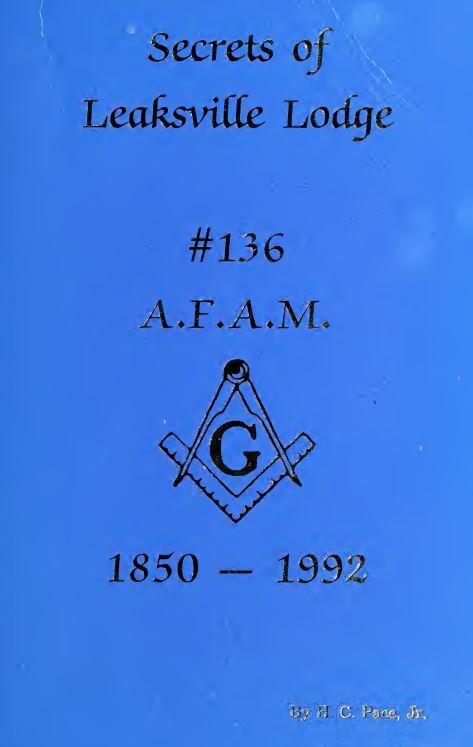 These new materials are all proceedings from the meetings of various groups associated with the Freemasons. Most of the proceedings from this batch are from the Grand Lodge of A.F. & A.M., but there are also documents from the Convention of Royal Arch Masons, the Grand Commandery of Knights Templar of the State of North Carolina, the Grand Council of Royal and Select Masters of North Carolina, and the M.E. Grand Royal Arch Chapter of North Carolina. 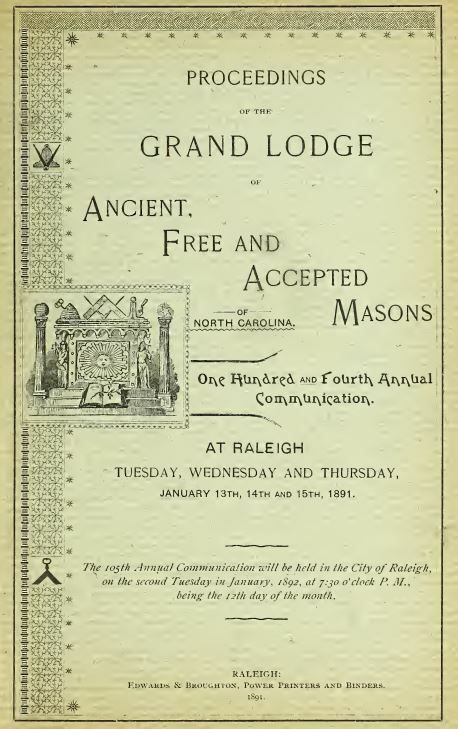 These proceedings are just a few of the many items that the Grand Lodge of North Carolina has provided for digitization. For more information about their other materials on DigitalNC, visit their contributor page or see these previous blog posts. For more information about the Grand Lodge of North Carolina itself and their activities, see their website. Livingstone College’s Andrew Carnegie Library has contributed another 13 yearbooks to be shared on DigitalNC, including the earliest volume from that school on the site to date (1927). There are now over 50 online. Located in Salisbury, Livingstone College was named after explorer David Livingstone. It has a long history – it was founded in 1879 and is one of North Carolina’s eleven Historically Black College and Universities (HBCUs). 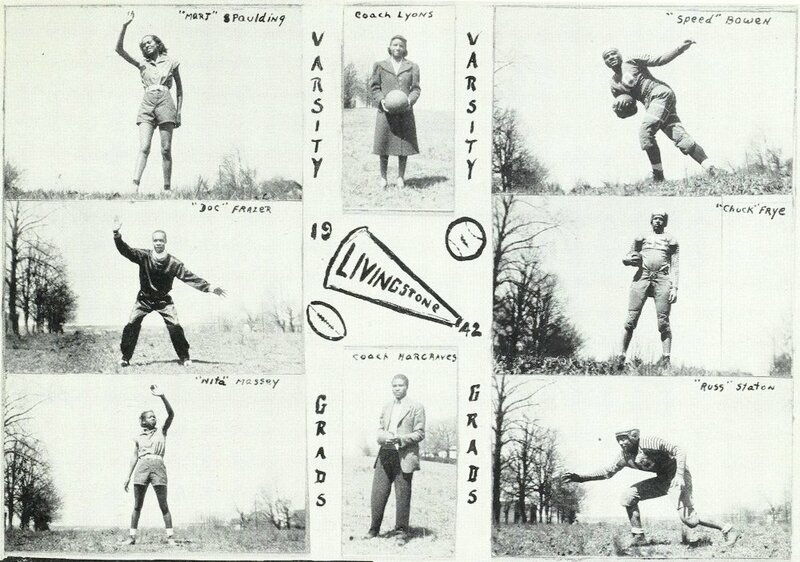 View all of the Livingstone College yearbooks currently available on DigitalNC. 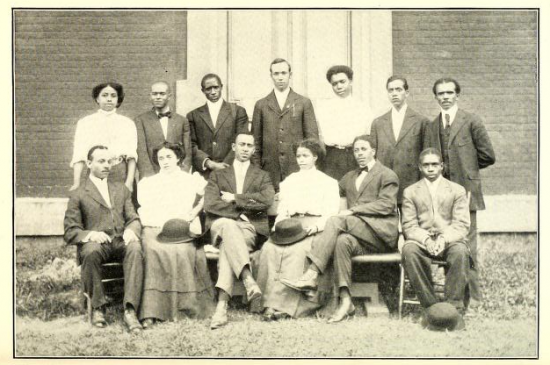 Students at Shaw University, 1911. With the recent addition of student yearbooks from Livingstone College, DigitalNC now hosts historic materials from ten different Historically Black Colleges and Universities in North Carolina. 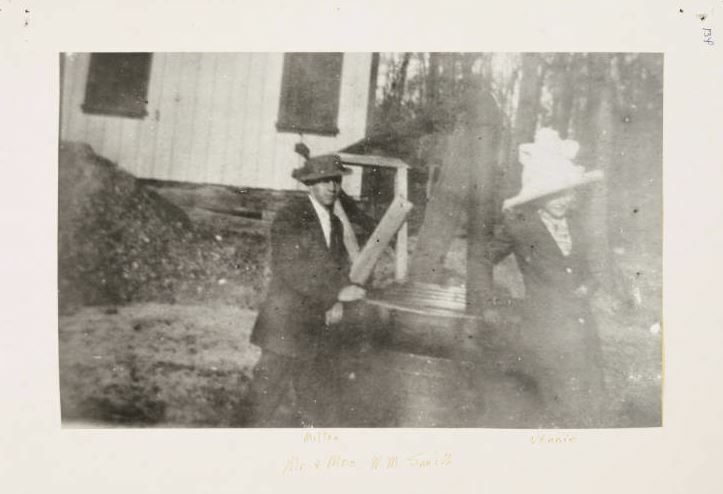 These materials document more than a century of African American higher education in North Carolina. From our earliest projects in 2010 to the present, the North Carolina Digital Heritage Center has worked closely with libraries and archives at historically black colleges around the state, and we continue to add materials from these collections on a regular basis. Follow the links below to browse yearbooks, newspapers, photos, scrapbooks, and more materials by school. Find more digitized Johnson C. Smith University history at Digital Smith. Find digitized student newspapers and more in the Bluford Library Institutional Repository. 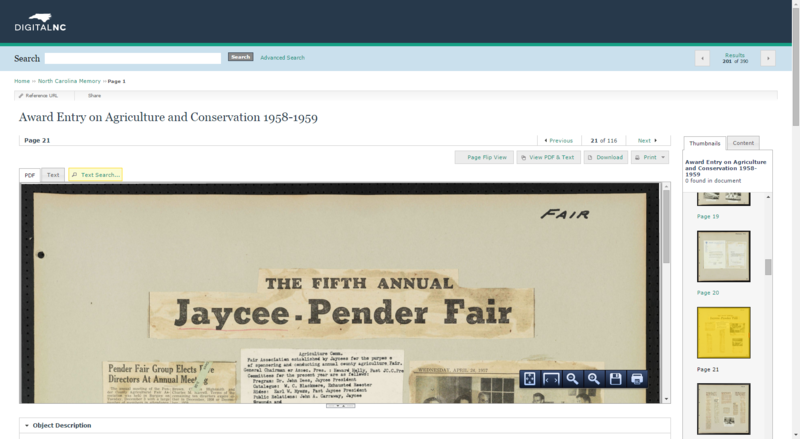 The UNC-Chapel Hill University Library hosts digitized manuscripts from the James E. Shepard and Floyd McKissick papers. 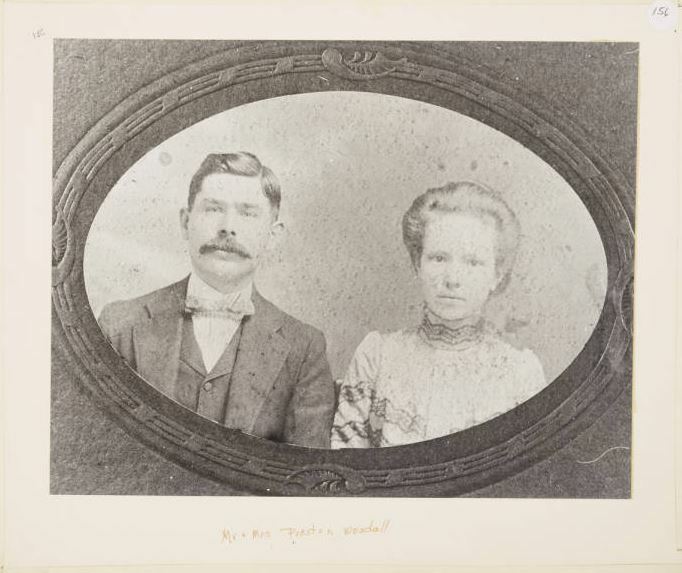 Find historic photos, documents, and more in the Winston-Salem State University Digital Library. 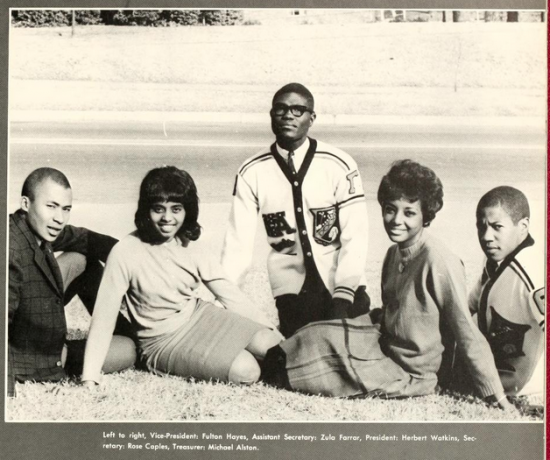 Sophomore class officers at North Carolina Central University, 1963. Cheerleaders from Chapel Hill High School, 1925. Thanks to recent work by our neighbors at the Chapel Hill Historical Society, we are pleased to announce that an additional eleven early yearbooks from Chapel Hill High School have been digitized and are now available on DigitalNC. The earliest added was from 1925, labeled “Volume I,” most likely the earliest high school yearbook available for Chapel Hill. It contains a lengthy history of the school. The new additions also include a few volumes from the early 1960s, showing a much different school, recently integrated and on the verge of moving to a larger, modern building away from Franklin Street. 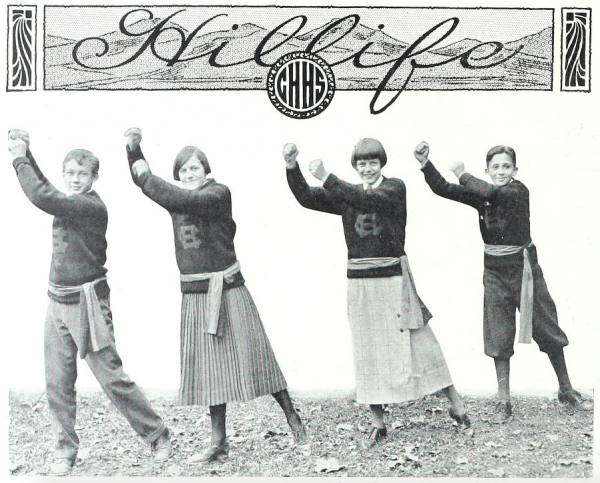 There are now 37 issues of “Hillife,” spanning the years 1925-1965, available in the North Carolina High School Yearbooks collection on DigitalNC. Chapel Hill High School, 1963. 21 building plans of the Bellamy Mansion restoration are now available on DigitalNC. The Bellamy family began construction on the mansion in 1859, in Wilmington, N.C. The Bellamy grandchildren maintained possession of the historic home until the late twentieth century; however, the mansion was in need of major renovations due to years of decay and an arson that took place in 1972. In 1992, Preservation North Carolina took over control of the home in order to open it to the public and began the restoration process. Boney Architects oversaw the structural renovations and published all of the recently added plans. Several feature the Carriage House on the plantation property, which is now the Visitors Center of the museum. All of the Bellamy Mansion site and building plans found on DigitalNC offer a picture of what structural restoration can look like for a major historic home. 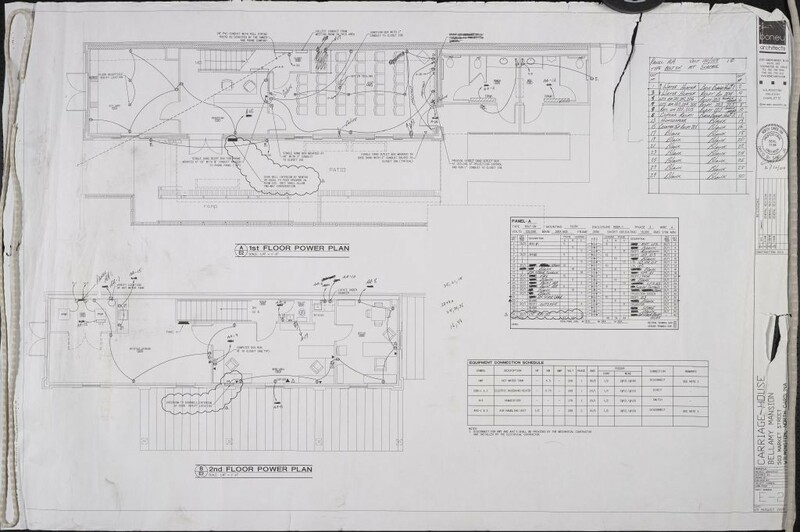 Many of the maps feature the hand-written notes of contractors on the project. They demonstrate the work that lies beneath the finished product of restorations. For more information on the building plans of Bellamy Mansion, please see the blog post for the previously added plans. For further research on the Bellamy Mansion, visit the website. We’re pleased to welcome a new partner with the addition of 14 student yearbooks from Asheville-Buncombe Technical Community College. The school began in 1959 as the Asheville-Buncombe Industrial Education Center. 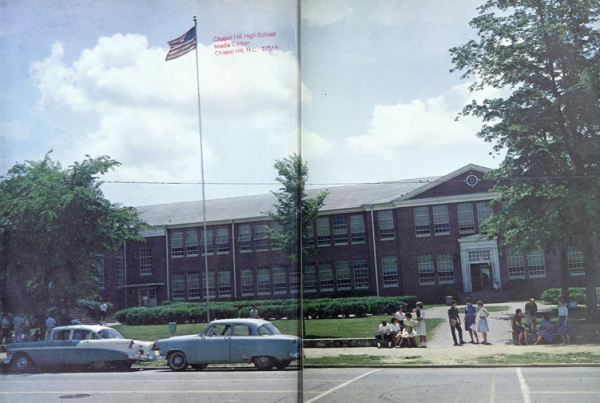 The earliest yearbook we have online is form 1963. The school provided professional education for students in the area. The early yearbooks show students working in classrooms devoted to a variety of jobs, including machine repair, industrial chemistry, automotive maintenance, nursing, welding, and woodworking. 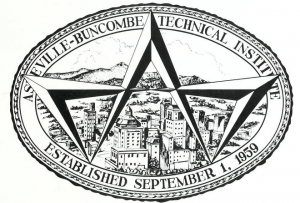 After joining the statewide community college system in 1963, the school changed its name to Asheville-Buncombe Technical Community College. The yearbooks are from the college history collection in the Holly Library at A-B Tech. From the 1968 edition of The Mountain Tech, Asheville-Buncombe Technical Community College. 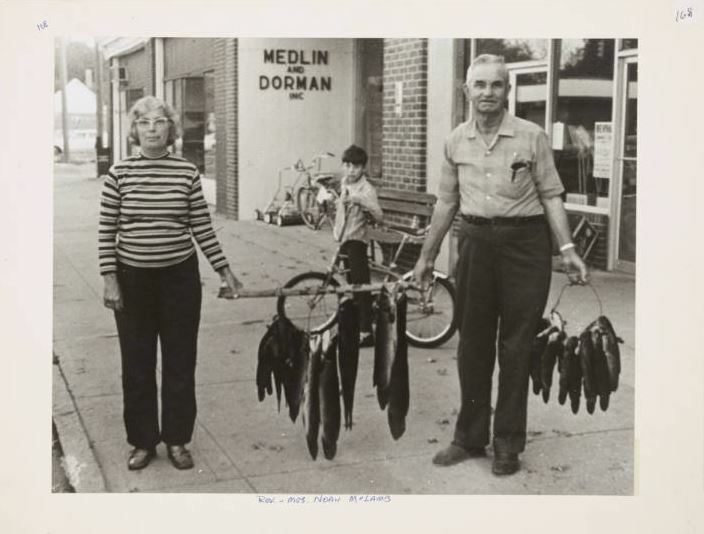 A new batch of photographs from the Benson Museum of Local History has been uploaded to DigitalNC. Many of these enlarged photographs feature prominent members of the Benson community throughout the years. Whether formal or informal, these portraits let viewers see the faces of the individuals who played important roles in the town, and some show quite a bit of their personalities as well! Another theme in this batch of photos is the Atlantic Coast Line Railroad that ran through Benson, and was later known as the Seaboard Coast Line. 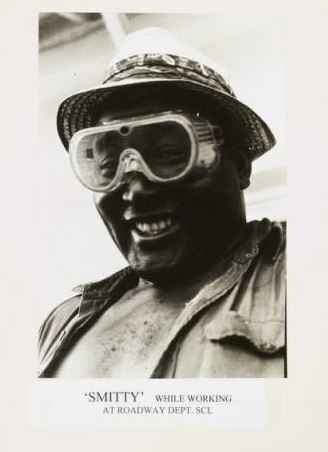 The photographs range in time from the early days of the railroad in the early 1900s up through more modern times with portraits of workers. 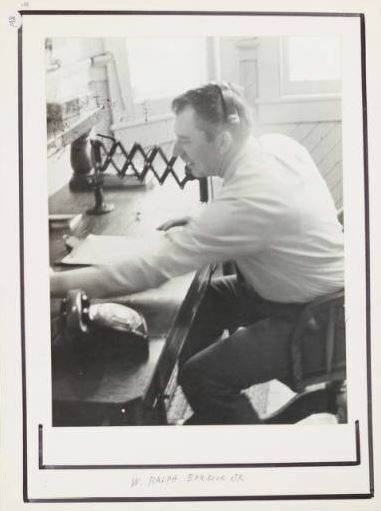 Telegram Operator, W. Ralph Barbour Jr.
To see other photographs the Benson Local History Museum has shared on DigitalNC, check out their contributor page on our website, or this previous blog post. For more information about the Benson Local History Museum and their collection, visit their website.